LEGGI QUESTO ARTICOLO IN ITALIANO! Have no idea on how to style your resume? 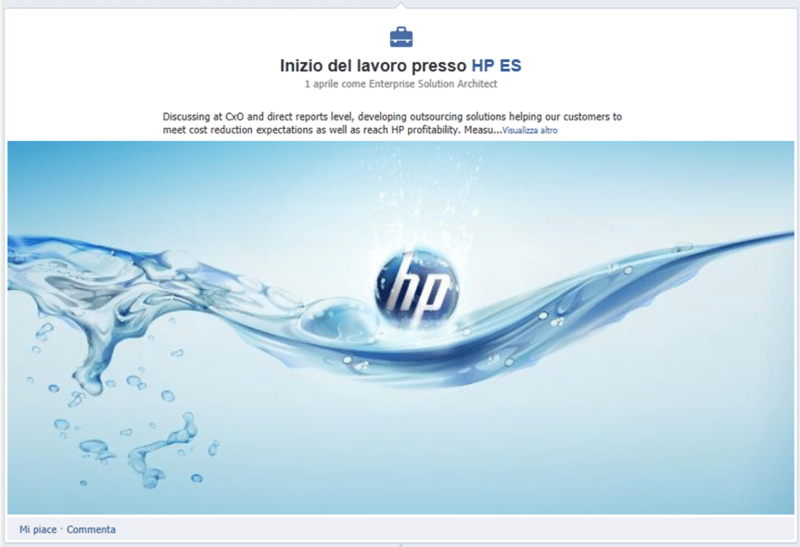 Why don’t exploit the new Facebook Timeline feature to create an original and professional resume? Intrigued? 😉 Keep on reading.. 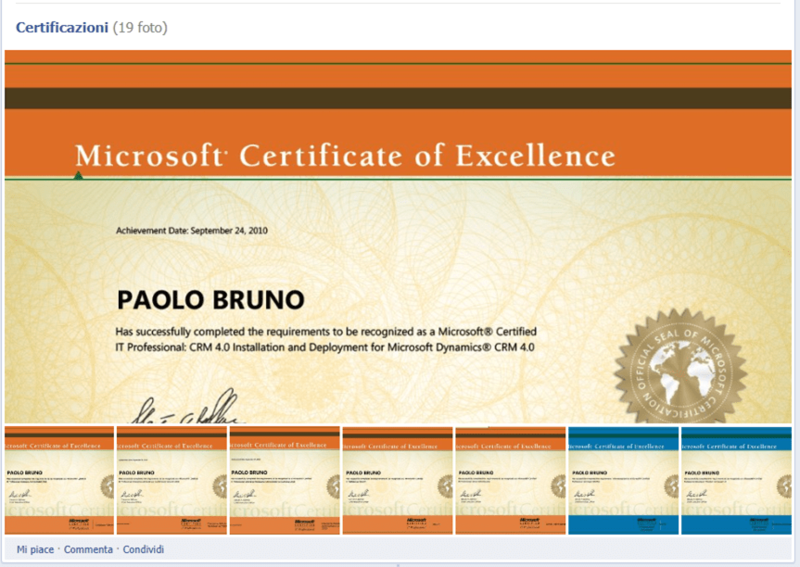 I started by creating a new Facebook profile with the username cv.paolo.bruno. Just below the header, on the left side of the page there will be the name of your last company and your address; on the right side, the list of your friends, album, etc will be shown. On the right side of the bar, hide the unnecessary section. Remember: you can’t hide the album containing the main images! At left-bottom a link labeled “Information” is shown; if people is interested in your cv, it can access trough this link to the detailed information you added. At the beginning of the Timeline add on the left a brief post with Social Network Links (Facebook personal profile, Linkedin, GPlus, Blog …) and on the right important updates and last post from my blog. Remember: everything appears in chronological order, from left to right: thus, if you update the last blog post, you will have to add your Social Network Links again. Your job activities and collaboration will appear in chronological order. Add an image for each company and fill in the details about each activity. Apparently, there is a bug with the Timeline. In fact, the configuration is not correctly saved if some posts is configured in “Reduced Mode”. I would definitely prefer to configure events such as “The End of Job/Collaboration” in “Reduced Mode”, but I’ve to wait for the bug to be fixed? Configure your profile as “Public”, so everyone can see it. Increase the privacy level for tags settings and for “Who can post on your Wall”. Set the option that only “friend of friends” can send you friend request. 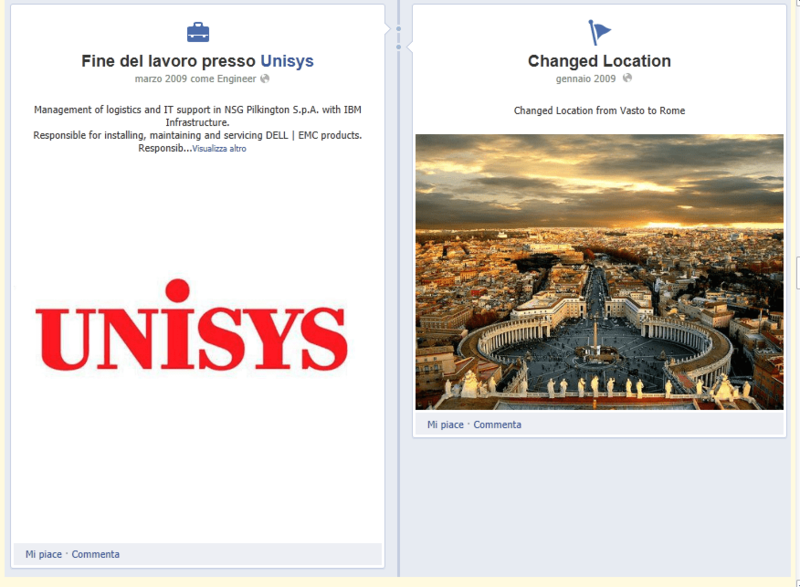 Previous Creare un Curriculum con la Timeline di Facebook.